Try before you buy! Visit weblogo.terrapinlogo.com to try out Terrapin Logo online. Download a desktop version for Windows or Mac from the links on this page. The free-to-try version is fully functional with the exception of saving data, printing, or controlling robots. Requirements are Windows 7 (64 bit) or later, Mac OS Yosemite or later, or an HTML5 browser for the online version. A single license code unlocks Terrapin Logo on any device, allowing you to print, save, and control robots! Begin programming on your desktop computer and continue on the go using your tablet, phone, or other connected device. Logo is simple to start but has never been so accessible or powerful. Special offer! For a limited time, Terrapin is offering a free InO-Bot turtle robot to schools which purchase a multi-user Terrapin Logo license, including Classroom (20 users), Multi-Classroom (50 users), or Campus (500 users) License. InO-Bot is the Logo turtle come to life in robot form. 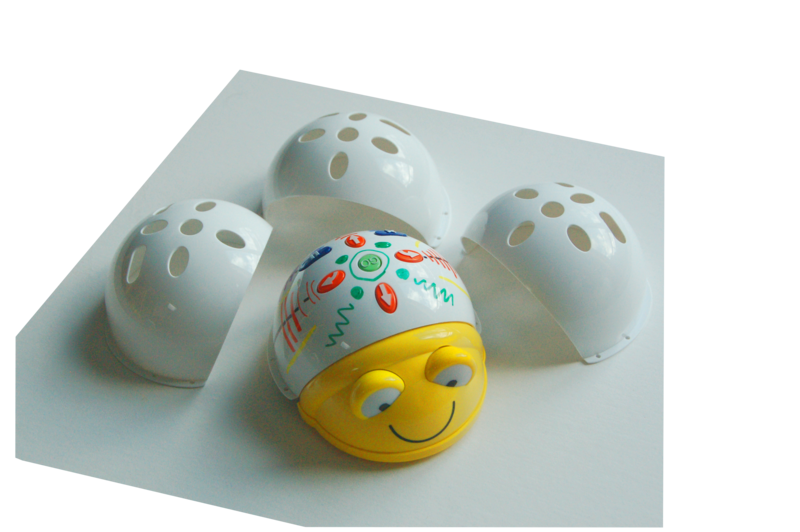 Send InO-Bot forward and back, turn it left or right, and raise or lower its pen on the floor or table just like the turtle on the screen. The purchase of a multi-user Terrapin Logo license automatically generates a coupon code which may be used to order InO-Bot free of charge! All versions are free to try with limitations (no printing, saving, or robot control). A single license code unlocks all Logo features, including printing, saving, and robot control, across all versions. Requirements are Windows 7 (64 bit) or later, Mac OS Yosemite or later, or a HTML 5 browser for the online version. Terrapin Logo is the latest and most complete implementation of the Logo computer language. Terrapin Logo is available as a desktop program on Macs and Windows PCs and in a browser on any connected device that supports HTML 5, from PCs to tablets to smartphones. Terrapin Logo is the successor of Terrapin Logo v4 and previous versions and includes many new, exciting commands that take advantage of connectivity and the latest Web technology. There is no installation and the latest Logo version is immediately available each time you log in. Terrapin Logo includes a full set of popular turtle graphics and other Logo commands. If you have used any version of Logo in the past, you can get started right away in Logo with familiar turtle commands. Terrapin Logo offers up to 1,000 turtles and millions of colors. In addition to turtles, Terrapin Logo allows any graphic image to be added to Logo and moved, animated, and sized. The Toolbox provides drag-and-drop access to Logo resources making it even easier to start exploring. You can even drag and drop control elements like buttons, list boxes and more. Logo's 450 commands include the full set of Logo data handling, conditionals, procedure and file management, flow control, and numeric operations in addition to turtle and graphic control. Programming is easy with a full-featured editor with context-sensitive text coloring and a complete set of debugging aids. Terrapin Logo is integrated with online storage, so files can be saved and access from the browser on any device anywhere. Create your own Web app! Terrapin Logo lets you publish your finished Logo program as a standalone Web application for everybody to run and enjoy. Simply distribute the unique URL that Terrapin Logo provides when you publish so others can see and try your programs. Manage your own Logo classroom! Terrapin Logo allows creation and management of classroom groups. Classroom licensees can grant access to a specified list of students who can collaborate with the teacher and/or each other by uploading, downloading, and sharing programs and code. A multi-classroom or campus license allows the creation of as many classrooms as needed. Since Terrapin Logo is accessble in a browser on any device as well as on laptops and desktops, students can access their work from home or any other connected location, and even show off their work to parents and friends. See Logo Classrooms for more information. Terrapin Logo includes comprehensive online Help directly within Logo itself along with an expanding range of resources to support Logo programming. Online Help includes command definitions, illustrations, and examples which can be copied and pasted directly into Logo to try out. Published Logo programs created by others are available for examination within Terrapin Logo and tips, tools, and sample programs and projects are available on the Terrapin web site for different age groups, experience levels, and subject areas, a collection to which new materials are regularly added. Terrapin offers and economical upgrade path from previous versions of Terrapin Logo. Contact Terrapin for information on upgrading from previous versions. Schools which purchased a multi-user Terrapin Logo license during the 2017-18 school year are also eligible to try a free InO-Bot. Contact Terrapin for more information. Click here to learn more about Terrapin Logo!